Pour beer into medium saucepan. Add a few slices of onion and warm over medium heat. To frying pan, add peppers and remaining onion slices and saute until tender. Place bratwurst on grill over medium heat turning frequently to brown on all sides for 10 to 15 minutes. Remove brats from grill and immediately place in saucepan with warmed beer and onions. 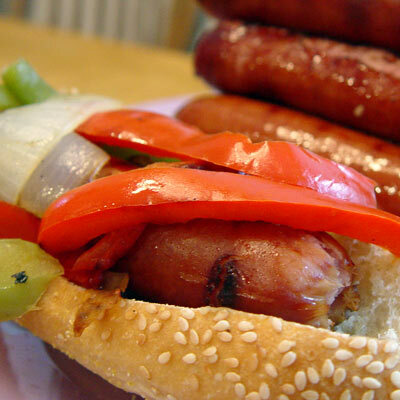 Place bratwurst on buns and smother with peppers and onion. Add mustard and relish if desired. CONSUMER: One coupon per purchase only on product(s) and size(s) indicated, any other use constitutes fraud. Void if reproduced, altered, or expired. Do not transfer. Consumer must pay sales tax. Valid only in the United States but void where prohibited. May not be combined with any other discount or offer. RETAILER: This coupon will be redeemed for face value plus 8� handling charges, provided terms of offer have been complied with. Any other application of this coupon constitutes fraud. Invoices proving sufficient stock to cover coupons must be made available upon request. Mail coupons to: Cumberland Packing Corp. 1361, P.O. Box 880001, El Paso, TX 88588-0001. Cash Value 1/20 of 1�. � Cumberland Packing Corp. All rights reserved.